Stephen and Linda Johnson have started a new Outdoor Company, Waller Outdoor, initially serving the Waller Texas community. They have recently installed their first structure with two digital faces. Insider caught up with Stephen to discuss their new business. Stephen, welcome to the out of home community. Can you share with us your and Linda’s business background? My family has been in the printing and newspaper business since I was a small boy. My wife began working at the family newspaper business after we were married in 1991 in both the business office and in advertising. That relationship fostered her creative side and we ultimately bought the newspaper when my parents retired in 2008 giving her the responsibility for all of the advertising for the newspaper – sales and creative. It is a small community newspaper that covers local news not covered anywhere else. Advertising revenues are stable and have been self-supporting for many years now. Why did you chose to invest your time and money into Outdoor? As technology advances and print publishing remains somewhat the same, we felt a desire to move “towards the light” after seeing a digital billboard in a suburb of Houston, Texas, which does not allow any digital billboards. It seemed like a natural progression to augment our newspaper advertising revenues with digital billboard advertising revenues. We are in a small community, so technology of this type was non-existent. Our area is the last growth corridor out of the greater Houston area, so we wanted to get in early and get our established customers comfortable with the idea (as well as new customers coming into our area). Tell us about your first structure? I understand it was just completed? We chose two back-to-back 10′ x 20′ Daktronics digital billboards for the business district of Waller, Texas, which is in a 35 mph speed zone. Drivers can see our boards well over the one-minute rotation! The boards were installed in early January and went “live” on January 22, just over two weeks ago. I think we have had more fun learning the scheduling software and learning advances in the creative software than we thought we would. It is so much fun watching an ad you created go “live” on the board. 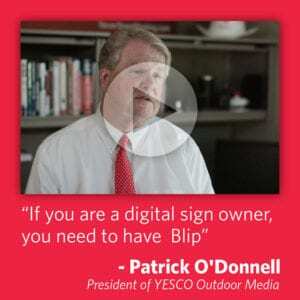 Why did you chose to go with Daktronics? How has the relationship been? We chose Daktronics for several reasons. They were always available for any questions we had; since it was our first venture into OOH, we had a lot of questions. Our sales person and PM were super helpful and treated us like family. We also had a clear view of what we expected with our product after installation and that was having someone on board that could help us with anything that came up, from technical support on the scheduling software to monitoring support with the displays themselves. We were new at this and we wanted to make sure our chosen dealer would be there with us when and if needed. 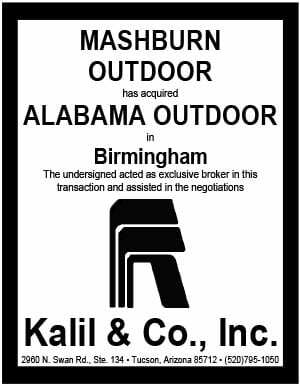 We also wanted to go with a reputable industry leader and our research showed that Daktronics was heralded as the titan in the industry, so we chose them. How has the Waller community responded to the new structure? Waller is a small community and other than the newspaper, there are not a lot of advertising options. Most information is spread by word of mouth, but as the community grows — and more and more industry makes Waller their home — we expect to see the billboards become more popular. Everyone who has contacted us is excited about the boards and most were expecting much higher prices than we were offering. In addition, most were not familiar with how digital billboard rotations work nor were they familiar with the capabilities and options they had when buying space. It is a learning experience for everyone and overall, the reception has been positive.